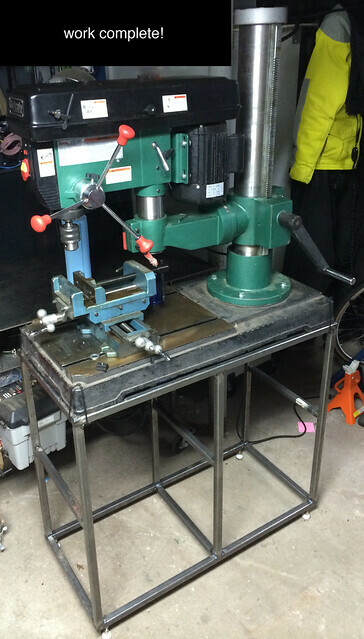 Vacation project: put the little drill press on a big stand. Well, “little” in that it weighs 500 pounds and not 1200 pounds like my CNC rig. A little sketching, some layout in Rhino5, then some welding. It’s not finished — it needs side panels and painting — but I’ll deal with that in the Spring after the snow has thawed. The scale doesn’t show in the photo, but the base is about 32″ off the floor and the top of the drill press is over 6′ high. I’ll be bolting this frame to the floor before any serious use, I’m enough of a safety nerd to not want a 500 drill press toppling over in my shop.